Protect the innocent. If there is any one principle that drives hit-woman Nadia Stafford it’s this. When she was 13 she failed to protect her older cousin Amy from being raped and murdered. Now, she fails again, disastrously, when she botches a hit on a man who’s been beating his wife. Before she’s had a chance to fix things, the wife is murdered and Nadia plunges into despair. To help her find equilibrium again, her mentor, Jack, brings her a gift: the location and new identity of the serial predator that killed her cousin. Vengeance, justice? With the predator in her sights, nothing seems more right, more straightforward, more simple. But fierce as Nadia is, she is shaken to the core by what she discovers about the real events of her past. The wounds inscribed on her soul during the long night when her cousin was killed have shaped her, and justice is wild indeed. The girl with straight As, designer clothes and the perfect life – that’s who people expect Rachel Young to be. So the private-school junior keeps secrets from her wealthy parents and overbearing brothers…and she’s just added two more to the list. One involves racing strangers down dark country roads in her Mustang GT. The other? Seventeen-year-old Isaiah Walker – a guy she has no business even talking to. But when the foster kid with the tattoos and intense gray eyes comes to her rescue, she can’t get him out of her mind. Isaiah has secrets, too. About where he lives, and how he really feels about Rachel. The last thing he needs is to get tangled up with a rich girl who wants to slum it on the south side for kicks – no matter how angelic she might look. But when their shared love of street racing puts both their lives in jeopardy, they have six weeks to come up with a way out. Six weeks to discover just how far they’ll go to save each other. 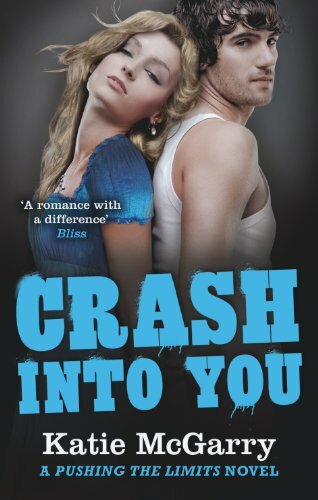 This entry was posted in Joan Frances Turner, Katie McGarry, Kelley Armstrong and tagged Crash into You, Frail, Wild Justice. Bookmark the permalink.